I looked up this little guy on Youtube and google and finally found a full comic strip dating from the begining of the 40s and drawn by the excellent Floyd Gottfredson. Like me you probably don’t know this artist so listen to that. 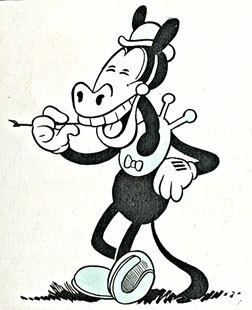 In 1935, he took over Ubi Werks and for 45 years, was in charge of all the Mickey Mouse comic strips after a very short career as a Disney inbetweener. His style has evolved a lot in 45 years and probably in line with what people were doing in the animation department. If you want to know a bit more about him and his style, head to the following website http://stp.ling.uu.se/~starback/dcml/creators/floyd-gottfredson.html You will find there some example of the different art periods but as a summary, here is the classification made by the author. Funny enough that strip is dated from 1935 but the author mentioned above would have called that style the 1933 “Mosozoic” instead of Classic 1. If you like this designs, go and have a look on Clark Snyder’s Inspiration Grab Bag blog. He posted 100 of Floyd Gottfredson Disney’s comic strips. This week I had the great pleasure to see a wonderful movie which used the traditional Captured Performance technology. You know the one where the picture of actors get printed onto celluloid not the crappy lifeless motion capture stuff. 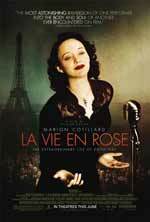 Olivier Dahan “La Vie en Rose” (2007) is probably the best movie I have seen for a long time. Yes the editing is a bit confusing, yes Dahan omitted to mention the second world war and some important parts in the life of 1950 french singer Edith Piaf, yes it is a bit long, but this dark, emotional tale is such a pleasure to watch and even if you don’t fancy 1950’s song you can only succumb to the stunning interpretation of the first famous french Rockstar by Marion Cotillard. If just like me you don’t understand why Zemekis wastes his time and my time releasing crappy lifeless movies then “La vie en Rose” is for you! This post seems to have attracted some attention lately so I feel I need to to make an update. I graduated from Animation Mentor in 2008 and haven’t had much contact with the school or the current AM community for a very long time so take this article with a pinch of salt. I haven’t caught up with the recent changes at AM, well I have but I just couldn’t understand the new syllabus (actually it is not that hard http://www.animationmentor.com/animation-program/animation-basics/ they just made things appear more complicated when they announced the AMP pipeline). Back in my days, AM was a great foundation course from which a lot of people went on to get feature animation jobs and build an incredible network of professional animators friends. This probably still applies in 2013. If you already have plenty of animation experience though, I might direct you to other online or on-site animation schools like Animation Collaborative, AnimSquad, Ianimate and AnimSchool since those are only taught by senior feature animators and even supervising animators from top studios. The way things are going, if you don’t go to one of those recent “polishing schools”, I don’t thing you will be able to break into feature animation nowadays. People around me know that AM has been for me a love and hate relationship all along and unlike some other students I didn’t get caught in the “everything is awesome” bubble that wraps most people as soon as they join AM. I did my fair bit of bashing in the past and nearly gave up in the middle of Class 5 but like fine wine, the school is gradually getting better and better and that’s amazing for a school who has been in business for only few years. Today I wanted to share a comment I posted on the Splinedoctors blog since I have more audience here than they will ever have. Just kidding. Well that s an interesting question that deserves to be answered. I would be tempted to say yes but looking around, how many cheaper options do you get if you are not french, already ultra talented and selected by Les Gobelins animation school? What else do you get for those $15,000 and ultimately, how long would it take you to pay back that money if you got this animation dream job? Personally that money was my savings to pay the deposit for a mortgage but since I was working while doing AM I could have quickly recovered the cost of AM with my new animation job. Now I live in UK, I have no clue if this applies to other countries, the dollar is at it lowest level since 1982 I am told. After 18 month at AM and without any animation experience previously, the students who reached the upper classes, apply for jobs where we are in competition with people who had been through 4 to 5 years of university! Some guys who applied for the same job I was applying for even had Masters or Post graduate diplomas! Does one realise how much it cost to spend 4 years at university? Think about the tuition, the housing…. Let alone the fact that most people can’t move city and have to do AM on top of a full time job. Now don’t get over excited ;-) This doesn’t mean that you just need to pay your $15,000 AM tuition to get a job. Your mentors won’t animate the shots for you and you will still have to work realllllly hard to polish this Showreel that will get you where you always wanted to be! Animation is hard, no matter how much you paid or what school you went to but AM gives you access to a crazy community of people who love and live for animation and if you make the most of it, you will definitely reap the rewards of it. Animation Mentor might seem expensive at first glance, but it is not. [update] at the moment, the Short film has been removed from the program. I am completely against the idea and I just hope they bring it back very quickly. 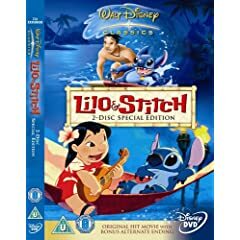 On my way food shopping today, I decided to visit the local Woolworth shop hunting for cheap DVDs and I found this little treasure, the two discs edition of Disney’s “Lilo and Stich”. The movie is great but the second DVD is just as good with nearly 2 hours of interview with Chris Sanders, Dean DuBlois, Andre Deja. It is a really intimate DVD which has nothing to do with your regular cartoon “making of” DVD where people jump around mimicking cartoony character. Be prepared, this DVD is probably aimed at a more grown up audience and some people might find the lenghty talking a bit boring but real fans of animation would love it. Some of the moments I really liked are the “Chalk Talk” where Andre Deja goes through the design of Lilo with the animation and clean up crew, teasing some animators who tend not to draw on model and there is also a little fight between Sanders and Dublois over the jumbo scene.